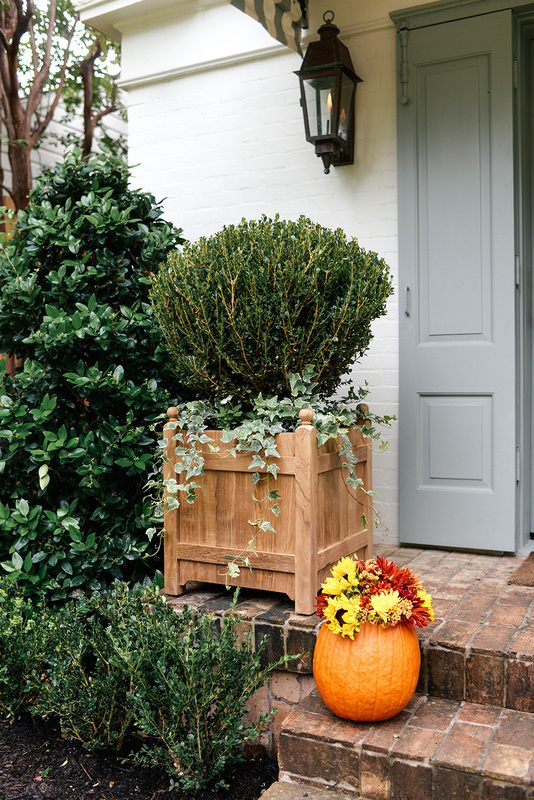 It’s officially October, which means it’s now acceptable adorn your house with pumpkins of all shapes and sizes! In addition to a bowl of little pumpkins on my bar cart and a few bigger jarrahdale pumpkins (they’re the prettiest teal color!) I’m planning to arrange around my fireplace, I love a good pumpkin center piece on the dining table. Last year my mom asked me to help her create a few pumpkin flower arrangements like this for Thanksgiving, and I decided to give it a try myself this year at my new house! The key to finding the right pumpkin for the job is to make sure it’s a tall one! First, you’ll carefully cut a pretty sizable hole in the top. The bigger the circle, the easier it is to arrange the flowers! 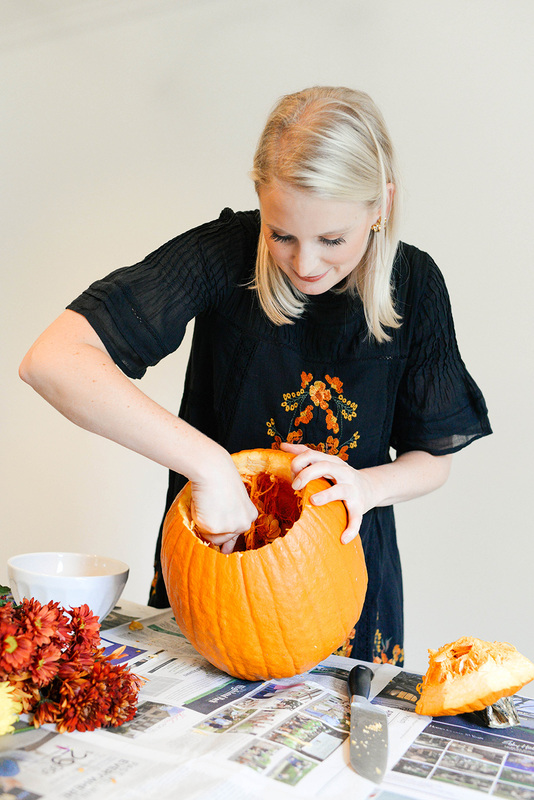 Once you’ve cut the top out, grab a spoon and scrape out all the gunk and pumpkin seeds on the inside. Feel free to save the pumpkin seeds to roast! While I’ve chosen a fall color scheme with my flower choices, you can really use any colors or flowers your heart desires! I love how white hydrangeas look in pumpkins too – so fresh and clean! The key to achieving balance is to select a variety of colors, bloom sizes and textures. Feel free to add succulents, leafy green stems and other accents to give the arrangement more life! 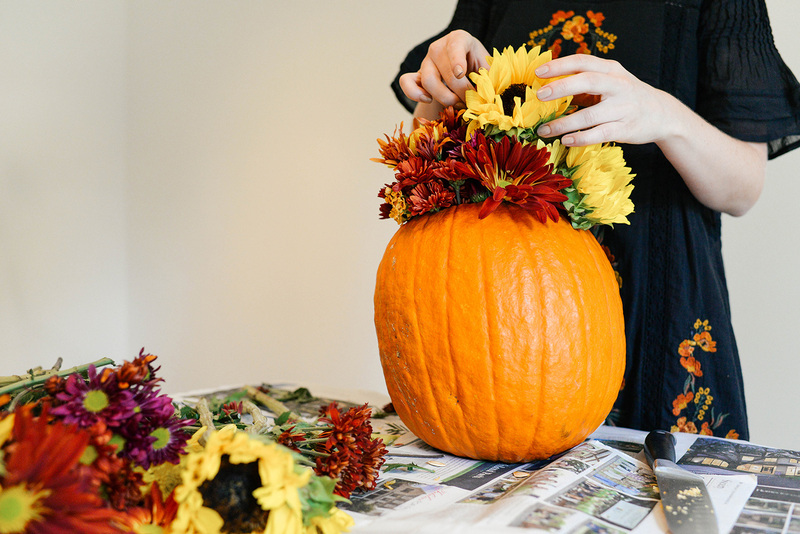 These pumpkin floral arrangements are super easy to make and a fun addition to any porch or dining table! 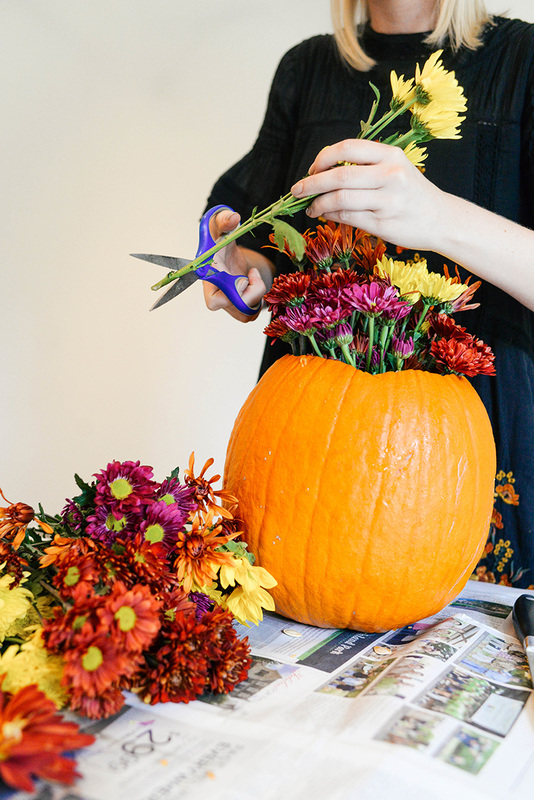 They don’t last forever having been cut open, so these arrangements are a great idea for an event, a dinner party, or a weekend when you want to add a special touch (like Halloween or Thanksgiving)! Also, how cute is this casual little dress I found at Nordstrom? 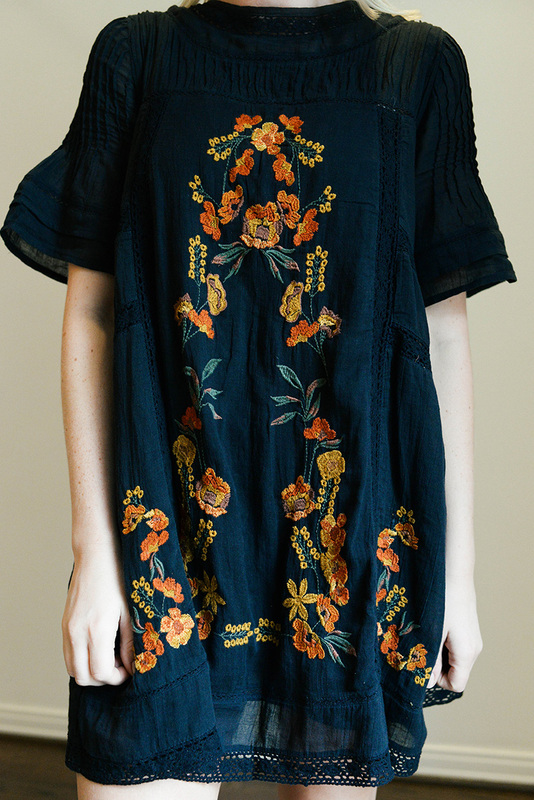 I love the comfortable silhouette and autumn-hued embroidery, don’t you? It’s the perfect piece for me to wear when I’m wanting to wear fall color while it’s still warm. I have a feeling I will be living in it over the next month! I’m wearing a size small and the dress is loose through the waist and hips! This dress is under $170, which I think is a pretty great price for something I know I’m going to wear a lot. 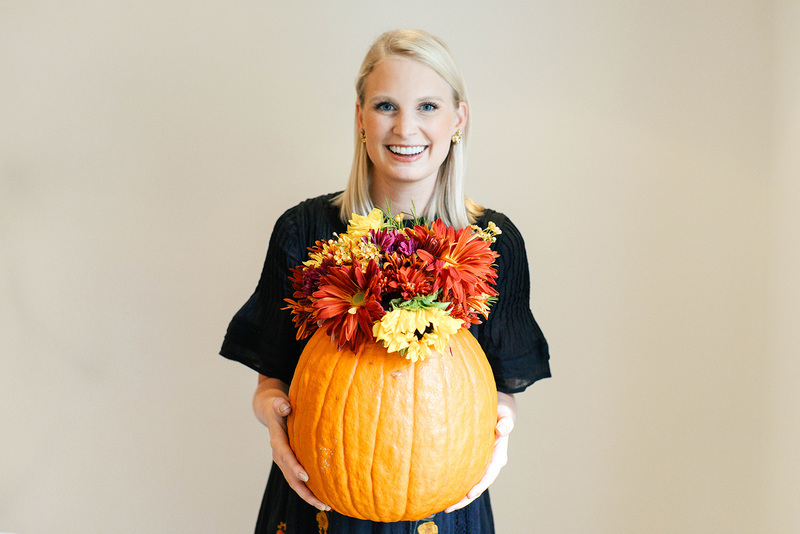 Shop more cute fall styles from Nordstrom below – most are under $150! The paisley print on this minidress is SUPER cute! Love the fall colors too. Ruffles and a romantic attitude are what you’ll find in this Topshop number. I found a similar dress to the one I’m wearing for under $50! The mustard color is a great option for fall wear. Fall florals have never looked better! Love this midi dress. This floral mini would be such a cute option for date night! Burgundy is one of this season’s biggest color trends! Wear it with this dress. This is the cutest floral arrangement! Love the idea of using the pumpkin as vase! so adorable! I’m going with small white pumpkins this year. a sprinkle of them here and there, but this arrangement is major inspo! 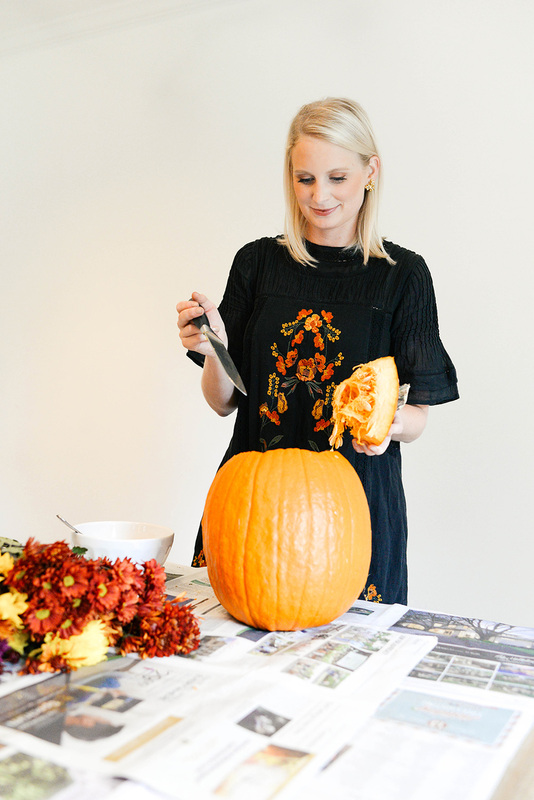 Such a fun and festive idea for fall! These are so cute, Merritt! Love it. This is such a cute idea! I bought a pumpkin to carve but didn’t do it so now I think I will do this!